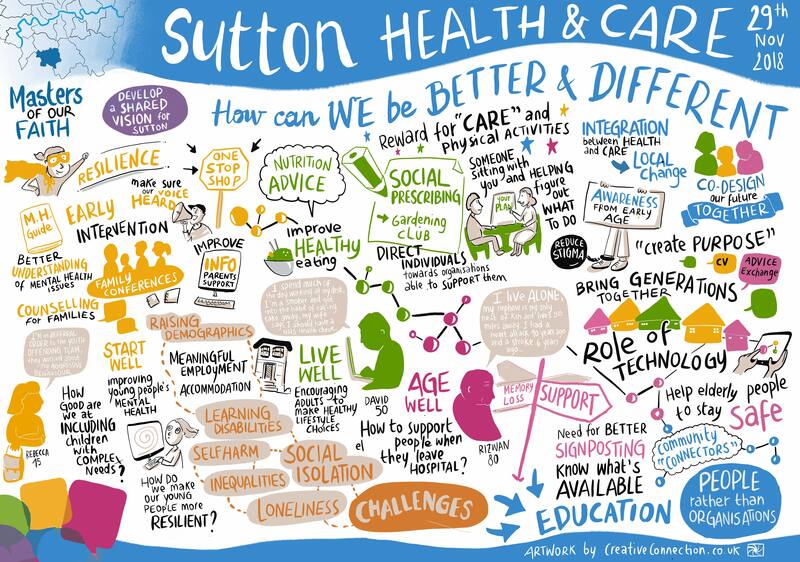 More than 120 people took part in Sutton’s latest health and care plan event. People from a variety of sectors joined public attendees to discuss the need for social connections and activities that bring people together. There was a focus on involving families in thinking about the wider determinants of wellbeing. how do we improve youth mental health? how can we better support parents with children with learning disabilities? how can we better support adults with learning disabilities? how can we encourage people to make healthy lifestyle choices? how can we combat loneliness and social isolation, particularly those post-retirement and very old? how can we better support older people when they leave hospital? The day celebrated what was good in the borough, while brainstorm practical responses to health and care challenges. There were some great ideas from the brainstorming. Below is a visual representation of the event, created by a graphic designer. The CCG and its partners will now think about how they can support some of the ideas generated.